You deserve to have an active and exciting winter, and you don’t want a painful dental injury to stand in your way. If you have had dental work such as dental implants, porcelain veneers or dentures from our dentist in Kalispell, wearing a mouthguard can save you from costly repairs. 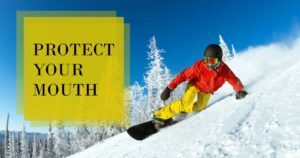 Reach out to Glacier Centre for Dentistry in Kalispell, MT for any help you need finding the best type of mouthguard for your winter sport. Our dentist and team are committed to helping you maintain the best dental health, whether it’s on the slopes or on the court.